I let the boys make their "new" breakfast cereal that they had created as part of the math unit last week. It was the most fun they have had with writing and I wanted to encourage them to keep trying. We discussed reading and following a recipe. I explained that sometimes a recipe didn't make enough food for everyone and at those times you double the recipe and as long as you double everything in the recipe it still comes out the same. I also explained that sometimes a recipe makes too much and then you can cut each ingredient in half. I asked them to think about that as we started following their recipes. We got out the biggest bowls we have in the house and started measuring the ingredients according to the recipes. For Alec's recipe they decided it was too much and we needed to cut it in half by the time we added just the first ingredient. It was a great lesson on division and fractions because they had to tell me what 1/2 of each measurement was. We also talked about making substitutions in a recipe since one of Alec's ingredients was a made up idea. He decided to substitute Lucky Charms for the missing ingredient and then we were ready to add milk. His recipe called for 8 cups; even halved that would have been 4 cups of milk. I held up the four cup measure and they thought it would be too much so we decided to add the milk one cup at a time and use our eyes to judge. We then modified Alec's recipe to reflect our changes. I think Alec was feeling a bit bad that his measurement was off by so much so I told him I was sure that anyone who makes up a recipe then makes the recipe and tweaks it a bit to work even better. We had to increase Evan's recipe by 3 so the kids had to triple the recipe and tell me the amounts. After just one taste of each recipe the boys decided we "MUST do this more often!" I told them if they continue to write the recipes down we'll continue to try them out (what could be better than self- guided writing?!). They all dug in to the sugary concoctions with relish and were allowed to try any and all of them! 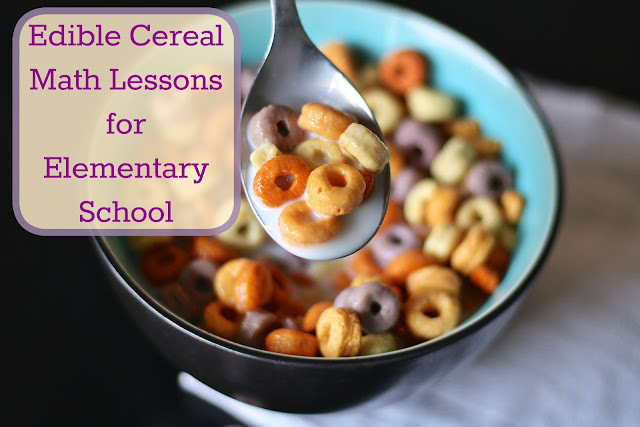 After they ate we finished up math with another couple cereal math lessons. The boys made their own abacus. We used a cup, turned it upside down and poked two holes in the bottom. We threaded a pipe cleaner through one hole and added fruit loops to the pipe cleaner (10 for Evan 15 for Alec and Ian) sticking up out of the hole. Once we had all the fruit loops threaded on we curved the pipe cleaner and placed the other end in the second hole. Then we flipped the cup over and twisted the to ends of the pipe cleaner together inside the cup. We then put the cup back onto the table and practiced using our abacus. We also made hundreds, tens, and one columns using pipe cleaners, fruit loops and Styrofoam. They make up a holder and then take turns rolling the dice three times each. For each number rolled they put cereal on the ones column, then the tens, and then the hundreds. The one with the largest number at the end of the round wins. It was another lesson in our cereal math and the boys once again thought the best part was getting to eat all the fruit loops when they were done. I did keep the bases and figured next time we want to use them we could always use beads. Looks awesome! Glad they're into Wonder Struck! I love it, and will recommend it now to everyone!